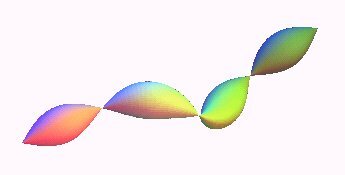 Parametrization: where and are the normal binormal vectors of the spine curve (G0) and a the radius of the tube. Area of the section : . Volume of this section: . The tubes with spine curve (or bore) the curve are the circled surfaces generated by a circle with constant radius centered on and the plane of which is always normal to this curve. They are also the envelopes of a sphere with constant radius centered on . They are the Monge surfaces with circular generatrix. The visible outline of a tube is composed of two parallel curves of the projection of the spine curve. Examples: the sphere (case where is reduced to a point), the cylinder of revolution, the torus, the coil. 1) take a non circular section: we get the notion of Monge surface, with a closed generatrix: Here is, for example, a tube with square section: be careful to eliminate the torsion in order to avoid the case on the right! 2) take a circle with variable radius, still orthogonal to the spine curve: we get the notion of tube with variable section. 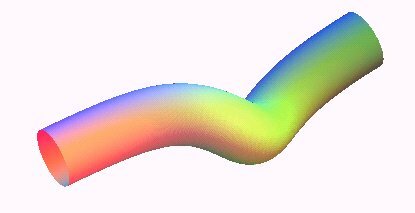 Here is, for example, a tube the section of which varies sinusoidally. 3) take spheres with variable radius centered on , and consider their envelope. When is linear, the notions 2) and 3) coincide, but not in the general case (cf. opposite). It is this general notion of envelope of spheres with variable radius that is sometimes referred to as "canal surface" [gray]. The characterization is: circled surface the circles of which are radii of curvature. See also the solenoids, coiling of a wire around a tube.